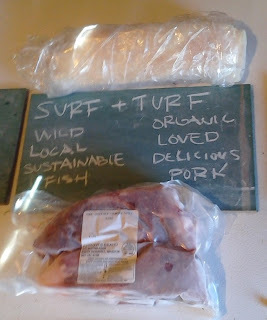 The pigs went to market last week and I picked up the fresh pork (chops, ribs, sausage, loin roast, etc) this past Friday. Smoked meat (bacon, ham, etc) is currently in the smoker and will be available soon. The freezer is now FULL of organic, loved, healthy, delicious pork. I truly believe that happy, healthy animals produce better meat and our pigs were darn-right happy. They enjoyed belly rubs, back scratches, ear massages, and more. Not to mention certified organic feed (no GMO or growth hormones), Big Love Burrito slop, Summer Dinner slop, acorns, and more. Sharing that freezer space is New England coast, wild, sustainably harvested fish. Flounder, Cusk, Monk, and more are portioned out into 1lb bags and ready for the taking. You can source surf AND turf from the freezer: 2lb country style ribs (think thick chops) plus 1lb of choice fish will serve 2-3 for dinner for only $25.